Holiday Golden Apples on Sale! Looking for a meaningful gift to give your children’s teachers and school staff for the holiday? 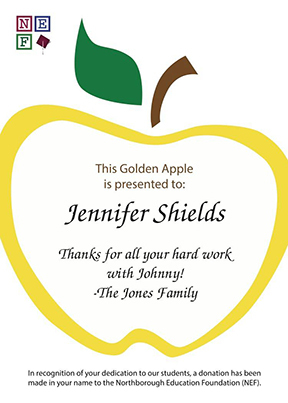 When you purchase a Golden Apple, you are making a tax-deductible donation in their name to the Northborough Education Foundation. The recipient will receive a personalized certificate with a special message from you or your child. For the holidays, NEF is also offering the option to add a Dunkin’ Donuts or Target gift card to your Golden Apple purchase, it’s one-stop shopping! What’s more, for the 2018-19 school year, all Golden Apple donations will be generously matched by Wheelhouse Wealth Advisors (www.wheelhousewealthadvisors.com). Golden Apples can be purchased for $15 each or 5 for $50 on or before December 17th, 2018. Apples will be hand delivered by NEF to the schools on December 20th.